In it’s original form, our Second Opinion Service focused on investment management. Market volatility and economic uncertainty have increased the need for “sound risk man agement” and financial guidance. Now is the perfect time to obtain a second opinion of your Financial Wellness Plan and the probabilities of success. However, sound planning has many elements. Today, our benchmarking services include much more than investments alone. 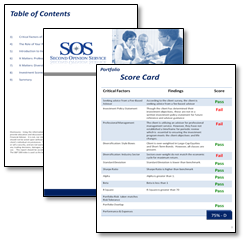 Our Second Opinion Service™ provides a “Report Card System” that quickly detects and demonstrates the strengths and weaknesses of your existing programs, along with recommendations for improvement. Depending on your circumstances, many critical factors may be scored; personal planning, investments, medical practice ownership, real estate, and more. Necessary adjustments are more easily identified, thus providing the confidence to make better decisions and avoid costly mistakes. Discover if your current program measures up to known standards and best practices. Designed to provide answers to common financial questions, some say the real strength of this service is its ability to answer questions that most people never ask. Is your Human Capital properly protected in the event of death or disability? Have you implemented the necessary steps to protect your hard earned assets? Are you fully aware of all fees and commissions associated with your current program? Do you have a properly written Investment Policy Statement? Is your business or medical practice reaching its potential? Have you properly planned for continuity or succession? Are your affairs in order should you pass away? Are you being paid for risk taken? Do you expect an inheritance?